Availability: In StockCoupon Description: Get a Free 5 Gallon Beer Keg With A Kegerator Purchase + $6.99 Flat Rate Shipping. William’s Brewing has some of the best prices around on Kegerators and right now the deal is even better! Purchase a Keg Kig Kegerator over the next two days and get a new free 5 gallon homebrewing keg! The Keg King Series 4 Kegerators are the only kegerators designed specifically for the home brewer. They feature Intertap solid stainless forward seal faucets, a tower cooling fan with a front panel on and off switch, an interior glass holder to keep chilled glasses handy, and a wide range thermostat adjustable from 26° to 82° F. These Kegerators include Intertap forward seal faucets come standard, mounted on a brushed 304 stainless tower. Besides being of extremely high quality, these are the only beer faucets that can be easily converted to a growler filler or stout faucet by just unscrewing the spout. You can choose between standard forward seal Intertap Faucets made of solid stanless steel, or Flow Control Intertap Faucets made from solid stainless steel. So act soon before this Williams Brewing Promo Code expires! The home brewing burner includes a high pressure regulator and allows for great flame control. MoreBeer.com Coupon Code Description: Save $5 On A InterTap Stainless Steel Beer Faucet With This MoreBeer.com Promo Code Today Only. These stainless steel Intertap Beer Faucets are forward sealing faucets and have a modular, threaded spout which can fit a variety of different attachments including a growler filler or a stout spout. Other forward sealing beer faucets use a floating ring, which is just as sanitary but requires the o-ring to move inside the faucet body in order to seal correctly. This can become a problem as the faucet ages. Intertap faucets use a sliding shuttle that guides the o-ring into the perfect position every time. So if you are looking for a great beer faucet for your home brewed beer, this is a great chance to pick one up and save $5! MoreBeer.com Coupon Code Description: More Beer’s hop rhizome sale is under way and right now you can save 40% on a huge variety of hop rhizomes! So you want to grow your own hops? Well in order to do so, you do not purchase hop seeds, or go to Home Depot and purchase a hop plant, instead, during this time of year hop rhizomes become available and your purchase the variety that you would like to grow! So what is a hop rhizome? A hope rhizome is a subterranean stem of a hop plant that sends out roots and shoots from its nodes. Hop rhizomes are also sometimes called creeping root stalks because the roots of the hop plant spread out underground as the plant matures and allows the plant to spread out and multiply. Hop rhizomes develop from buds and grow perpendicular. During this time of year, large hop cultivators will segment the rhizomes and sell them to home brewing supply shops like More Beer, so that home brewers like you and I can grow them ourselves! Since these are only available for a limited time and certain prized hop varieties typically sell out fast, you should probably act now! 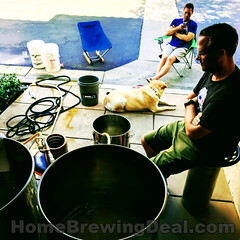 Sale Description: Right now at homebrewing.org you can save an additional $16 on any home brewing purchase of $100 or more. I did not see an expiration date on this promo code but I am guessing that it will not last long! I also did not notice any restrictions on this offer, so this is a great chance to save big on the already low prices that Adventures in Homebrewing offers! Get Free Yeast When You Purchase An Irish Ale Beer Kit At MoreBeer with Promo Code! MoreBeerr.com Coupon Code Description: Saint Patrick’s Day is just around the corner, so you best get brewing! To celebrate, More Beer is giving you a free packet of White Labs WLP004 Irish Ale Yeast when you purchase an Irish Ale Beer Kit at More Beer. Just Make sure to click the link and enter promo code BREW4PAT at check out to take advantage of this limited time promo code. Looking for the best price on Home Brewing Beer Kegs? Get a 4-Pack for Just $34 Per Keg! Promotion Details: Homebrew Ball Lock Kegs As Little As $34 Per Keg! Sale Description: Adventures in Homebrewing is having one of their beer keg sales and this is a good one! Right now you can pick up low profile ball lock home brewing beer kegs for as little as $34 each in a 4 pack. They even have new stainless steel homebrew kegs for just $65; that is nearly 50% off the retain price! So if you have been looking to add a few 3-gallon or 5-gallon beer kegs to your home brewery, now is a great chance to get some at a super low price! I am not certain how long this homebrewing promotion will last, and the prices are limited to stock on hand, so you might want to act fast! 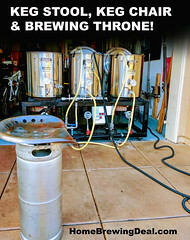 MoreBeer.com Coupon Code Description: Get Free Shipping On A NEW Robo Brew Homebrew System. This is the new, generation 3 of the popular RoboBrew home beer brewing system! This new version lets you set up to 6 different times and temperatures so you can do a fully automated step mash! The Robobrew home beer brewery is an all in one electric home beer brewery that has built in electric heating elements for heating and boiling. It also comes with a built in magnetic pump for circulation and a water resistant control panel for setting and monitoring temperatures. Best of all, the RoboBrew uses 110v power so it can be used nearly anywhere you want to brew! The RoboBrew features dual heating elements and runs them off of a single 110 volt plug. The digital control panel makes it easy to see the current temperature and set the temperature you want. 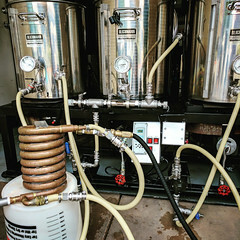 The Robo Brew brewing system also includes a stainless steel malt pipe with false bottom allowing you to easily shift from mash tun to boil kettle during your brew day. 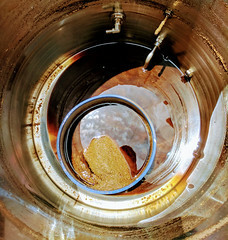 The malt pipe includes a handle to lift it from the RoboBrew and tabs at the base so you can set the malt pipe over the Robo-Brew to let the wort drain out. MoreBeerr.com Coupon Code Description: Today at More Beer, just use promo code BEERDEAL at checkout (While Supplies Last) and Save $7 On A 8 LBS PBW Homebrew Cleaner Purchase! PBW is the first choice for most home brewers when it homes to an all purpose cleaner for home brewing. It is great on materials like plastic and stainless steel and is the cleaner that I use for all of my home beer brewing gear. A little goes a long way and if you let it soak over night, it makes cleaning a snap! These limited quantity promotions almost always sell out, so you will probably want to act fast!